Groupon Student Program was a loyalty discount program. As the only designer on this project, I worked closely with a product manager, a media marketer and other stakeholders to create a brand-new campaign that aimed to target young Gen-Z students. Born after 1995, the new generation of young consumers, are not familiar with Groupon. Most of them don’t think of Groupon as a site for them or only heard about it from their parents. That’s because the current Groupon brand image is little out-dated, and the positioning is geared towards our current audience. For example, the current landing page only focuses on the discount, but does’t tell you what Groupon actually does. Its out-dated look & feel also fails to attract eyeballs. During the discovery phase, the context goes here. The dark look & feel accentuates the video/imagery and convey a sense of theatricality. In my initial meeting with the stakeholders, we agreed on a basic landing page structure that highlights the value props and top catogories. I also presented moodboards for the team to disccuss the look & feel we’d go for. We were all excited about the possibility of creating an illustrative campaign to break away from our day-to-day stock image driven marketing design style. 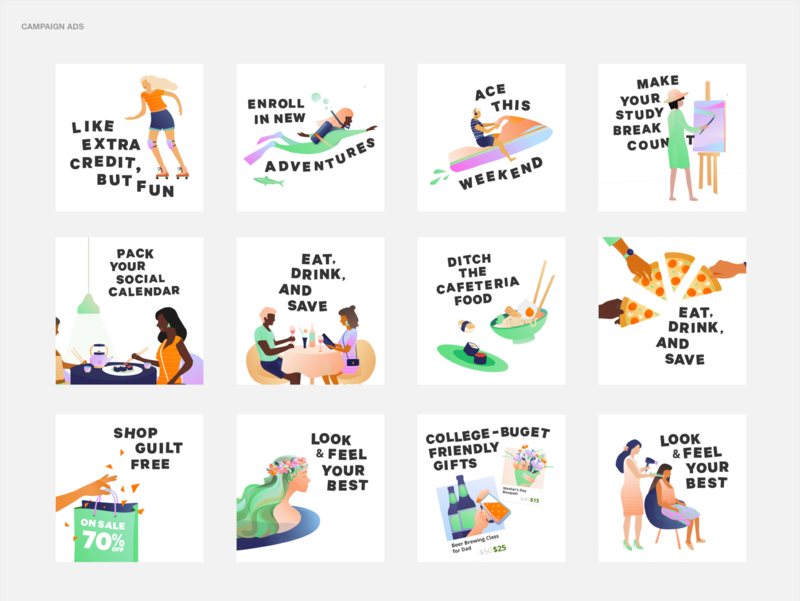 Illustrations depicting coupons and savings tend to be cheesy. How might we make using Groupon cool? A unicorn piggy bank of course. It showed the viewer - “saving money can be fun too” - the message we wanted to send to our target audience. A unicorn piggy bank of course. It showed the viewer - “saving money can be fun too” - the message we wanted to send to our target audience. 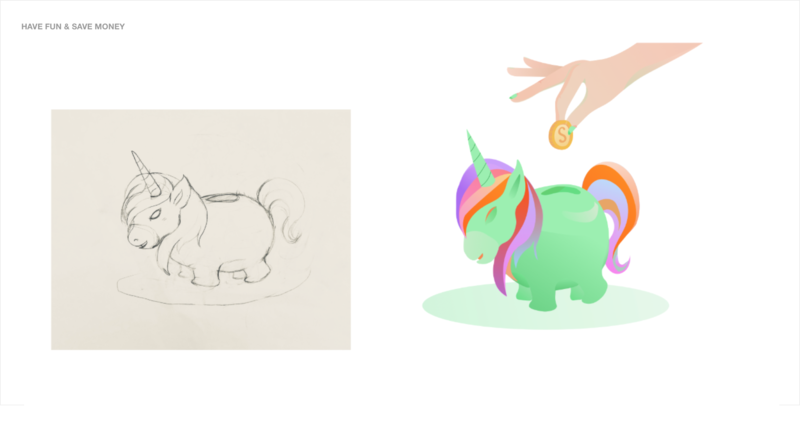 From the “unicorn piggy bank”, I constructed a color palette of gradients & solid colors. It consisted of bright & trendy greens and their complementary colors. The contrast between these highly saturated hues produced a luminously refreshing yet readable aesthetic. To further define this look & feel, I created 50-60 items to materialize “food”, “drink”, “fun” and “campus”. Using my own pictures, street photography and online resources as reference, I went on to create 6 base characters” in a various movement - radiating energy and passion. I built a larger set of unique characters from these base ones by varying poses, hair styles, outfits. This set of illustrative characters and elements served as the building blocks for the campaign creatives. The splash page aimed to make a bold impression. It led with our main value prop “extra 25% off food, drink & fun” for students while using other elements as visual teasers. I optimized illustration composition for different screen sizes. 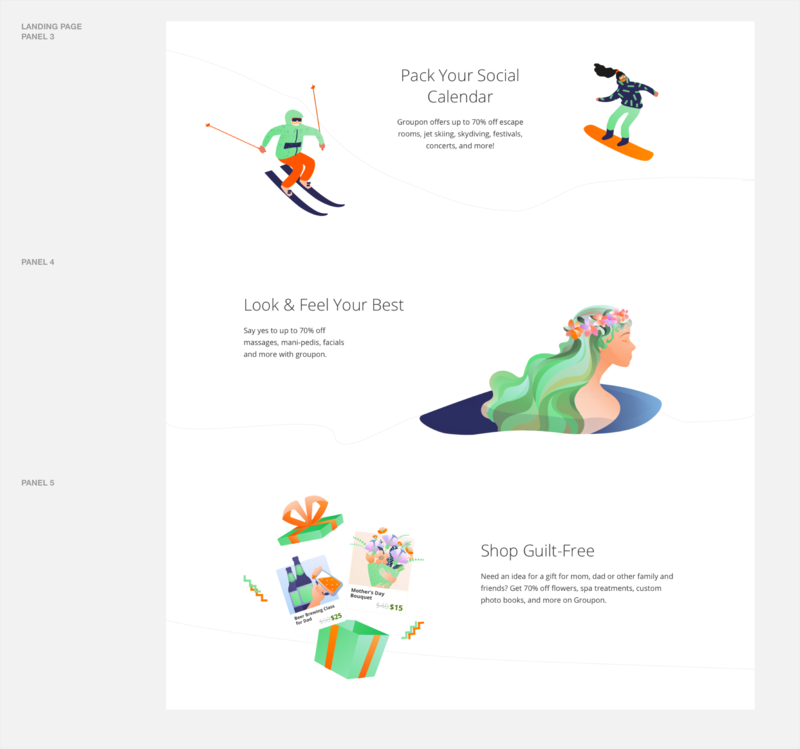 The rest of the landing page focused on telling the full story - why you should use Groupon and how you could use Groupon. To come up with witty promo spots, I worked with a copywriter to bounce ideas back and forth. We first identified key themes including “ adventure”, “food & drink”, “Beauty” and we would go off to generate some images/taglines ideas on our own. Some of these matched each other naturally, but for the ones that are unmatched, we would then pick out our favorite ones and make custom images/taglines. Most of the illustrated elements in these promo spots were reusable components. For example, for a restaurant-themed scene, you could easily change the interior decors, food on the table or characters to convey moments like “date-night”, “girls-night-out” or “sushi night adventure” etc. Our visual language also found its way to student ambassador uniforms and promotional swags, posters & postcards.